It gives me great pleasure to address the General Assembly on the occasion of the 6th Review of the UN Global Counter-Terrorism Strategy. We join others in thanking the Permanent Representatives of the Kingdom of Jordan and Finland and their teams for their able efforts in facilitating negotiations on the resolution we have adopted today by consensus. We welcome the successful outcome of the process, which reaffirms the imperative of a stronger and more effective global response to defeat international terrorism, in light of the evolving nature of this menace, which has only grown in scope and magnitude worldwide. For us, the task of countering terrorism is one that our people have been engaged in for over two-decades – even before 2001, when the UN adopted a more comprehensive approach to combat this global threat. In this regard, our struggle has persisted on the basis of our national efforts to defend our territorial integrity and sovereignty, and enable our people to live a life of dignity, in peace and tranquility. Today, our struggle continues, supported by the international community, against terrorist groups intent on undermining our democracy, disrupting social stability, destroying our infrastructure and above all, preventing us from becoming a peaceful and secure country. Having said that, today we are a proud nation, defending our people and territory against elements of various terrorist groups that have come from outside our country. Our security forces have braved the challenge of fending off these groups in different parts of Afghanistan, at great sacrifice, despite continued attacks taking place against our people. Our fight against terrorism constitutes a core element of our nation-building efforts as we continue to build a democratic and prosperous society, grounded in the rule of law. In the broader context, as the front-line State in the fight against international terrorism, we are making a notable contribution to the security and defense of all people and nations around the world. Outside the battlefield, we are taking persistent measures to implement, in full, the many international counter-terrorism conventions and protocols. To that end, we have broadened and enacted new legislation to capture the full scope of various counter-terrorism instruments. We have updated the criminal code to unify our criminal legislation, which also includes terrorism offenses. Our judicial authorities, including the Attorney General’s Office, are prosecuting terrorism cases on a continued basis. We have repatriated a number of foreign terrorist fighters (FTFs) from our detention centers to their countries of origin, in accordance with provisions of relevant SC resolutions. We have also taken new measures to counter the financing of terrorism, such as curtailing the illegal flow of currency. The Financial Action Task Force (FATF) has verified our compliance with international standards related to countering the financing of terrorism. Our holistic approach to countering terrorism and violent extremism also includes the development of a countering violent extremism (CVE) strategy, built on a bottom-up effort in districts, towns, and villages to identify potential sources for radicalization and measures to counter them. Key aspects include empowering the role of religious figures and institutions to condemn terrorism and violent extremism, and to generate confidence in communities by ensuring effective service delivery, on the basis of our National Peace and Development Framework (ANPDF). Our effort to secure peace for our people is another area in which we are making important investments. If successful, this will have a profound and positive impact on countering terrorism, reducing violence, and promote peace-building. We are working closely with regional and international partners, including the UN on this issue and hope to achieve the desired results. The Global Strategy on which we meet today is the overarching framework for the international fight against terrorism. It complements important counter-terrorism instruments, including international conventions and General Assembly resolutions on this subject. In this regard, success in our vital endeavor depends on States meeting their international obligations, under international law. We hope this year’s resolution will generate more decisive action in countering terrorism based on the zero tolerance approach, as highlighted in the resolution. That also means denying terrorist groups safe havens, freedom of operations, movement and recruitment, and any form of financial, moral, and material support. Likewise, promoting greater understanding and cooperation among different religions and cultures must gain new impetus globally. New attacks in different regions and continents have proven, again, that terrorism is a threat against human civilization as a whole. Victims of this evil phenomenon are of distinct religious backgrounds, cultures, and strata of society. Moreover, we must not allow lingering regional and international tensions to undermine a more effective global response in combatting terrorism. More can and should be done to find solutions to common challenges, including preventing new conflicts, and resolving old ones. In short, strengthening the spirit of mutual cooperation in today’s global order can only benefit our counter-terrorism efforts. Victims of terrorism are often left traumatized and demoralized after experiencing the worst one can imagine. We are pleased that this year’s resolution projects greater focus to the plight of such victims– people who have been affected physically and emotionally from the evil phenomenon, including bereaved families of those who have lost their precious lives. Further, the text we have adopted underscores that victims of terrorism must be granted immediate support, in the form of medical, psychosocial, financial, and other forms of assistance. As the initiator of the GA resolution entitled “International Day of Remembrance of and Tribute to the Victims of Terrorism,” we hope that the imperative of support to victims will continue to gain proper attention in the work of the United Nations. We welcome the new emphasis given to the imperative of strengthening the UN’s response to combatting terrorism, including its role in helping States to strengthen their operational capacity to address terrorism in all its forms and manifestations. As many have highlighted in the course of this debate, the creation of the UN Office of Counter-Terrorism provides an opportunity that must be fully utilized. We believe the new office can benefit from the experience and human resource of States that have been involved in combating terrorism over an extensive period of time, and should also tailor its assistance to priority needs of concerned States. 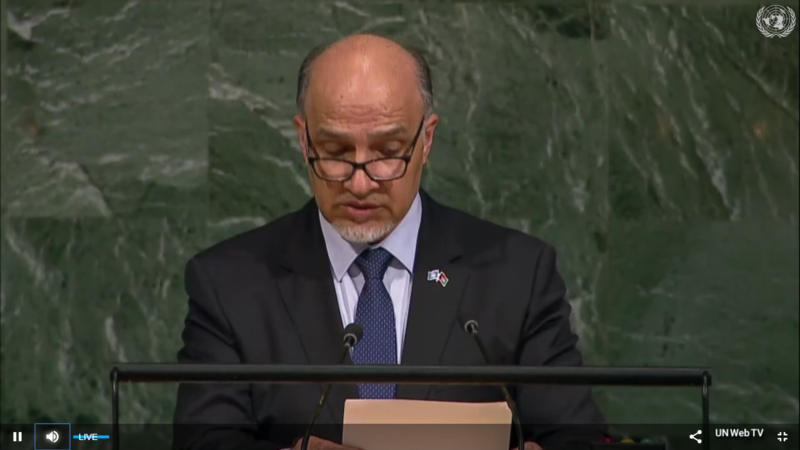 In conclusion, Afghanistan welcomes the adoption, by consensus, of today’s resolution on the 6th Review of the UN Global Counter-Terrorism Strategy. As ever-before, we remain a committed partner in the broader effort of implementing the Strategy for the benefit of all our citizens and a safer and more secure world for our current and future generations.